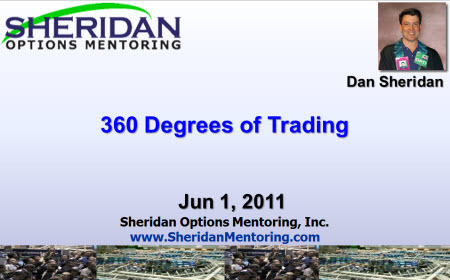 Dan just finished lesson one of the 360 Degrees of Trading with Dan Sheridan, sponsored by TradeMONSTER. Dan is putting on several trades. Dan will update these trades 2 times per week in live 15+ minute sessions. This is the most practical, hands-on, class we’ve done. What about the use of WEEKLYS as the short options vehicle with the covered writes? That’s an attractive trade. We have several students doing that I believe. Have you done it with live trades?